Learn more about reading the Bible in one year here. California’s gold country, 1850. Angel expects nothing from men but betrayal. Sold into prostitution as a child, she survives by keeping her hatred alive. What she hates most are the men who use her, leaving her empty and dead inside. Then she meets Michael Hosea. A man who seeks his Father’s heart in everything, Michael obeys God’s call to marry Angel and to love her unconditionally. Slowly, day by day, he defies Angel’s every bitter expectation until, despite her resistance, her heart begins to thaw. But with her unexpected softening come overwhelming feelings of unworthiness and fear. So Angel runs. Back to the darkness… A powerful retelling of the book of Hosea, Redeeming Love is a life-changing story of God’s unconditional, redemptive, all-consuming love. A page-turner. Narelle: I love this book, and I’ve read it more than once. 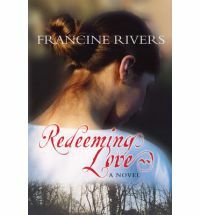 Redeeming Love by Francine Rivers (Monarch Books, 2004) is an award winning historical romance that has featured on Christian fiction bestseller lists for years. Francine’s writing is both beautiful and powerful as her characters retell the little known Biblical story of Hosea and Gomer. If you’ve never read Christian fiction and like reading romance, I highly recommend you start by reading Redeeming Love.